An interesting guitar with enough sonic difference to also make it a viable addition to PRS’s bolt-on canon. Appealing eco angle; working- player vibe; great build; powerful, resonant and versatile delivery. What you see is what you get: no options, no lefties, no colours. Using recycled or reclaimed wood for guitars is far from a new concept, not least in the light of the current problems the industry faces with the new CITES rosewood restrictions. So using unusual and unusually sourced materials seems to have gone mainstream. At this year’s NAMM show, for example, Fender launched its Exotic Series using some reclaimed woods, and now PRS has joined the fray with a limited run (approximately 600 pieces) of two guitars featuring old wood from the Atlantic Forest area of south-eastern Brazil for both the top and fingerboard, sourced by senior wood manager, Michael Reid. “Brauna preto (Melanoxylon brauna) was typically used as supporting posts for houses in the state of Minas Gerais in Brazil,” explains Michael. “Found only in the Atlantic Forest [Mata Atlantica] of south-eastern Brazil, it is only available now as salvaged or reclaimed wood, as commercial cutting of timber is no longer permitted in the Atlantic Forest. The wood for the carved top is called peroba rosa (Aspidosperma polyneuron) and is also native to the Atlantic Forest, as Michael Reid explains: “It was very popular for use as siding in rural houses and farm buildings, primarily in the states of Paraná and Santa Catarina in southern Brazil. This reclaimed wood is used on two natural satin nitrocellulose-finished guitars, the CE 24 and Vela. Both come in new semi-solid style, because apparently the top wood is relatively heavy. It certainly mixes the styles a little and our bolt-on CE 24 Semi-Hollow is nicely weighted (slightly under the standard solidbody CE 24) with a journeyman player’s vibe - quite a contrast to PRS’s ‘posh’ aesthetic. While some images we’ve seen show a more ‘exotic’ figured top, the two-piece centre-joined top here is quite plain, a medium caramel brown with light figure and even a small unfilled ding (a nail hole, apparently) just to the side of the volume control. The flat satin finish cries out for a little burnishing, or even subtle staining, which might have lifted the figure - the slab sawn one-piece back has quite a dramatic figure, especially on its sides. The fingerboard looks rosewood-like until you notice some subtle striped figuring, parallel to the frets, in the lower fingerboard positions. It’s a typically clean build. The single bass-side f-hole, like the rest of the guitar, is unbound, but you can feel inside of it - the bass-side is pretty hollow and the air extends to behind the bridge, but not into the treble side. Construction aside, it’s the same setup as either of the existing CE 24s: top-lock tuners, pattern wide neck profile, dual uncovered 85/15 pickups with partial coil- splits. It’s a ‘halfway between Core and S2 level’ model: S2 hardware (PRS designed Korean-made) and S2-style neck (three- piece with head-splice and additional heel stack), but the pickups are made in the USA. The top carve of the Core-level body is shallower than the standard carve (with no indents under the controls) and neither the rear cover plates for the vibrato springs nor the electronics are recessed, but sit proud. Irrespective of its production level, this is one very fit-for-action guitar. The neck needed a slight tweak to introduce a little relief (it’s a two-way rod so that’s swiftly done) and it’s very stable tuning-wise, too, even with some pretty energetic whammy action. Sound-wise, there’s a good resonating acoustic response, not overly hollow-sounding, with a slightly rounded and less zingy treble than our reference McCarty. If the partially hollow build adds a little thickness to the voice, then it’s lapped up by the 85/15 pickups. In the partial coil-split mode, the single-coil sounds are strong and clear but far from brittle, with an almost marimba-like percussive character. There’s not a huge volume leap into the full ’bucker tones, but enough to change the character into a bigger rock voice that again sounds strong and quite focused. Despite the treble bleed cap, pulling the volume back likewise pulls back some spike and, like any good instrument, you seem to discover another subtlety every time you plug in. 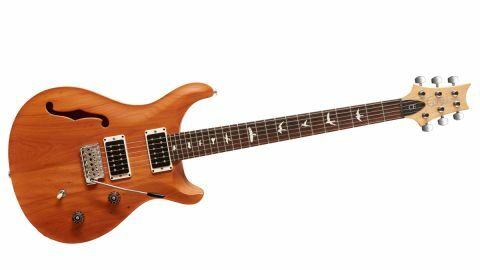 This is an interesting take on a PRS bolt-on, and whatever the wood choice and semi- solid construction are bringing to the table, it’s hugely viable while offering a different aesthetic - not to mention backstory - with a slightly pushier, midrange-coloured take on the CE 24.